Over the next ten years, 15GW of new capacity annually is expected to be added to the global offshore market, driven mainly by Asia. After China, forecasters predict that Taiwan will become the second largest offshore market in Asia, installing 5.5GW offshore wind target by 2025 and about 1GW of new capacity each year going forward. On top of the environmental and health benefits that come with moving to clean wind energy, Taiwan serves to benefit greatly from a booming offshore market to stimulate the local economy, creating green jobs, investment in local infrastructure, and becoming an export hub for the growing offshore industry. 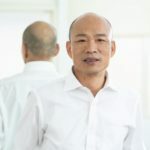 After a period of great political uncertainty and proposed changes to the Feed in Tariff which concerned many of the offshore wind industry’s top developers, the Taiwanese government has now announced a revision to proposed changes to the Feed in Tariff (FiT) for offshore wind, making investment in the market attractive again. Although there are still concerns, this means that the offshore industry is back in business in Taiwan! There is huge interest in building up a crucial offshore market in Taiwan by leading industry developers and the government alike. 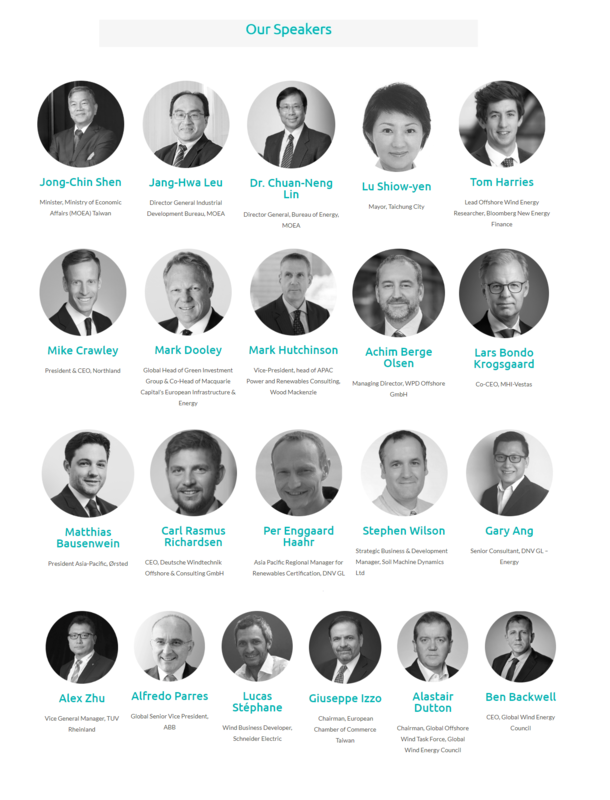 On 25 April, the Global Offshore Wind Summit – Taiwan will gather all these stakeholders under the same roof to discuss how to best ensure that this market reaches its full potential. 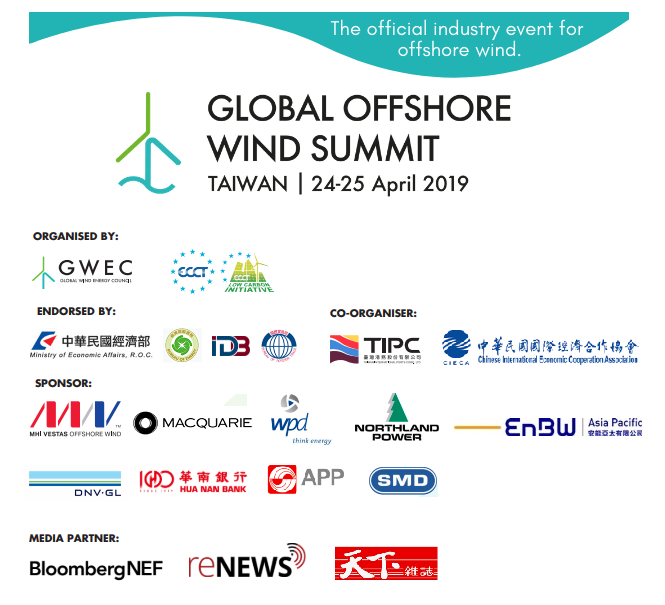 Organised by the Global Wind Energy Council and the European Chamber of Commerce Taiwan – Low Carbon Initiative, this is the official event for the offshore wind industry as they look to develop a key market in Taiwan. The Taiwanese government has certainly recognised the benefits of building an offshore wind market. High-level government stakeholders such as Minister Shen Jong-Chin Shen of the Ministry of Economic Affairs Taiwan, Director General Lin of the Bureau of Energy, Director General Leu of the Industrial Development Bureau and Mayors across Taiwan will all participate at this premier event. From a High-Level CEO Forum to breakout sessions covering supply chain, grid integration, and standardisation – all of the industry leaders such as Orsted, MHI-Vestas, WPD, DNV GL, Macquairie, Taiwan Power Company (TPC) and Northland Power will be discussing the invaluable lessons they learnt in other markets and how Taiwan could take advantage of the wind revolution to boost their local economy and build a clean energy system. The desire is clearly there to build a booming offshore wind market in Taiwan, and the Global Offshore Wind Summit – Taiwan is the perfect opportunity that can make this happen. 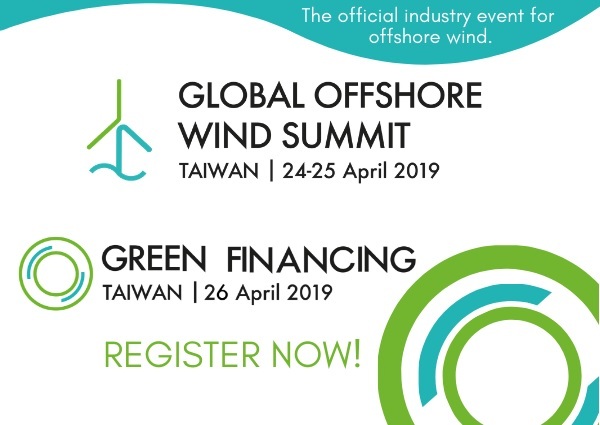 Join us on the 24-25 April in Taipei to be part of the official industry event for offshore wind and be a leader in the Taiwan market! *Please register the summit on GWEC's website. Any registration made on ECCT's website is invalid. 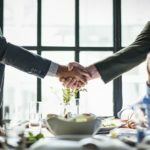 Corporate Renewable Energy Sourcing is one of the most important trends in the renewable energy industry right now and is attracting huge interest around the world, becoming a new source of financing for wind and other renewable energy sources globally. This half-day conference, keynoted by energy developers, buyers, and bankers, is designed to talk about the opportunities and challenges for Corporate Renewable Energy Sourcing potential in Taiwan. For full information on the Green Financing Taiwan event, please consult the event website.